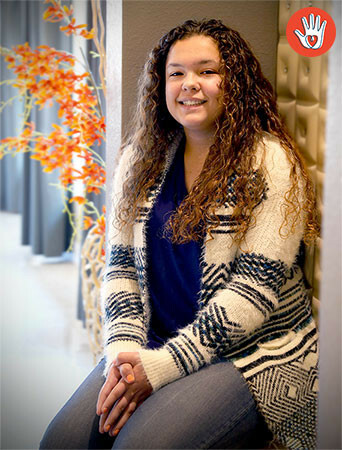 Izabella, who goes by Izzie, is a social and friendly youth upon first meeting. Izzie smart but at times still has some immature moments. Izzie has been accustomed to looking out for herself so she has had to grow up way too fast, therefore missing out on her opportunity to be a child. Izzie likes to be in charge and has strong leadership qualities, which need to be encouraged and shaped for the positive. She is able to process through her behaviors when she wants to and can identify her strengths and weaknesses. Izzie is adorable, fun, likes to be challenged, and is a little bit of a risk taker. She loves fashion, music, animals, and drawing and coloring. Izzie enjoys taking on certain tasks around the home and enjoys helping out. She connects well with animals and is very loving towards them. Visit me at the The Heart Gallery of Central Texas. Izzie will thrive in a home where she has structure and can be the oldest child. She is not opposed to having siblings but would like to be the oldest. Izzie will do best in a home where her parents can give her the attention and proper guidance she requires. She needs a forever family who enjoys being outside, going to parks, and being active within the community. Izzie does have an older brother who lives in Texas so it will be important for her forever family to live in Texas in order to maintain that sibling bond. Izzie will challenge you, but is never disrespectful. Izzie needs a family who will challenge her to experience new things and to keep her mind open to everything that is available to her. Most importantly, Izzie is in need of a home to adopt her and love her forever.